The purpose of the “Paw Power” Check-In and Check-Out (CICO) program is to increase opportunities for feedback, positive adult contact, embed social skills training, positive reinforcement on meeting behavioral goals, and increasing the home-to-school connection. Check-In and Check-Out (CICO) is referred to as “Paw Power” here at Iowa Valley Elementary. “Paw Power” is a group-based program that can accommodate a number of students. 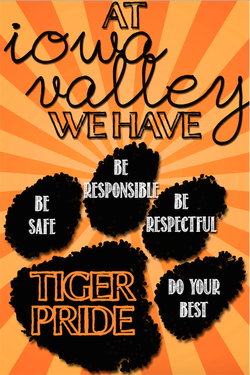 Essential features of the “Paw Power” program include increased structure, check-in, check-out, and connecting with a key school building adult. It provides a built-in system for monitoring students’ behavior progress, evaluating fidelity of implementation, and transitioning students to a self-managed program.